Independent Directions to this Site: From Highway 417, 53 km east of Ottawa, take exit 66 NNW toward Casselman. Go NNW 2.1 km on Main Street (Rue Principale) to the South Nation River, then continue on what is now Nation Street for a further 1.4 km to Route 500W. Turn left (stay on the same road) onto 500W and follow it for 3.5 km to Faucher Road. Turn right or NNW onto Faucher and go 2.2 km to Lacroix Road. Turn right or ENE onto Lacroix and proceed 1.0 km to the Route 400 (Lacroix Road) South Nation River Access. Larose Forest Loop Route Directions: From the Ross Alexander Wilson Natural Area, drive WSW 2.2 km on Route 300W to Baker Road. Turn left or SSE onto Baker and go 1.5 km to Lacroix Road. 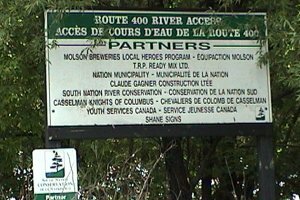 Turn left or ENE onto Lacroix and proceed 1.0 km to the Route 400 (Lacroix Road) South Nation River Access. Map of the Route 400 (Lacroix Road) River Access Area Click on other site numbers to go to their pages. 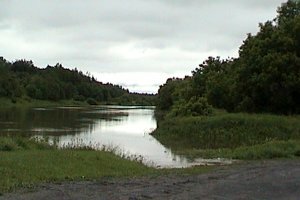 Site Description and Birding Information: This boat launch and picnic area has an excellent view of the South Nation River in a lovely setting. Larose Forest Loop Directions: This is the final site on the Larose Forest Loop Tour. To return to Ottawa from here, retrun on Lacroix Road the 1.0 km to Faucher Road. Turn left or SSE on Faucher and go 2.2 km to Route 500W. Turn left or ENE onto 500W and follow it for 3.5 km to Nation Street. Bending right onto Nation go 1.4 km ESE to Main Street (Rue Principale), and continue on it SSE for 1.8 km to Highway 417. Turn left onto the onramp for west bound traffic to Ottawa, wind round to the right to merge with the 417. Ottawa is 53 km west. Return to Larose Forest Loop. Return to Birding Ottawa Table of Contents.